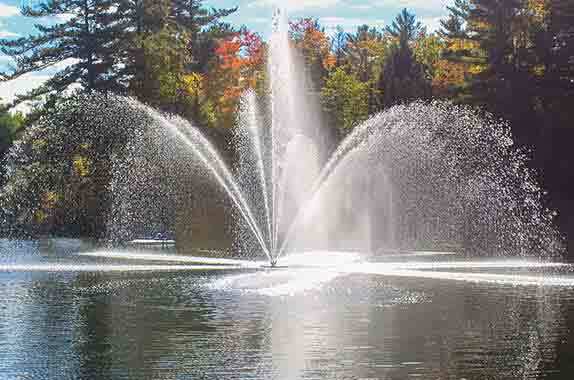 To ensure the utmost lifespan of your floating lake fountain & pond aerator winter storage is important. It is best to store pumps somewhere above freezing point during the winter season. By now, most of you understand how your lake fountain & pond aerator winter storage will help to keep your pond oxygenated when spring returns. However, some people may not know that our pumps are water filled and lubricated, and therefore could turn dysfunctional if they are stored in temperatures below the freezing point. We recommend storing your lake fountain or pond aerator pump anywhere that is considered out of the way and will not go below freezing point. If you experience winters like we do in Barrie, Ontario, you know it can last a while. This is why we recommend storing your pump out of the way, because it may be sitting there for a couple of months! Since your floating Lake Fountain or Pond Aerator has spent a great amount of time in the water, it may have leaves, weeds and some debris on its exterior. You should clean this up to remove any debris accumulation. While doing this also clean and check the power cable for any nicks or cuts. Coil the power cord neatly and if stored outdoors protect the connectors from weather. If you do have fish in your Pond or Lake and are worried about winter fish kill, we do have bubbler de-icers and surface aerators. Our bubbler de-icers and surface aerators have a high speed propeller which brings the warmer, deep water and creating an open space for your fish to receive the maximum amount of oxygen. Our pond surface aerators can also be used with the pump lower in the water in case the power goes out that the pump does not freeze in to the ice. When the power is restored it will simply start clearing an opening again.